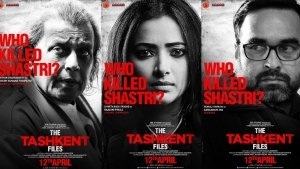 Based on one of the most controversial chapters of India’s history, The Tashkent Files tries to recreate a hard-hitting and volatile political drama. The film is based in modern times, as a journalist takes a deep dive into investigating Lal Bahadur Shastri’s death from 1966. While the pursuit of truth after half-a-century may seem jaded, the young journalist, played by Shweta Basu Prasad, chases the scoop because she’s overly ambitious and in the world of social media, any sensationalist topic, will do. So she and a whole host of politicians, social workers and civil servants, join a committee that has the task of uncovering and reinvestigating the truth. It’s a setup borrowed from 12 Angry Men, and the lack of novelty doesn’t help the proceedings at all.